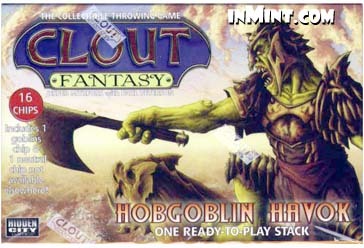 Clout Fantasy is a collectable throwing game for 2+ players. Knowing what to throw is as important as how you throw - can you master both? One Ready-to-Play Stack. Includes 1 goblins chip & 1 neutral chip not available elsewhere! Staking out dark, protected corners, sneaky hobgoblins ambush all who dare to draw near. Where goblins have gathered few dare to tread.